The Cloud computing growth rate is currently 5 times higher than the overall IT growth rate at $210b by the end of 2016. Oracle’s cloud strategy is to offer choice and flexibility with the most comprehensive, modern, and secure offering of cloud products and services for business, IT infrastructure, and development needs. Oracle Cloud is commercially and technically attractive for customers of all sizes from the smallest startups to the biggest multinationals. 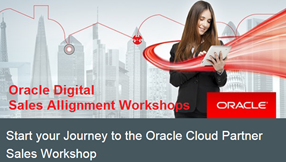 To help you understand more about these solutions and how you can take advantage of this market growth you are invited to attend a sales workshop at Oracle Direct’s Sales Centre in Malaga. At this session we will share the market opportunity, positioning, latest announcements from Oracle OpenWorld and give an overview of Oracle’s Cloud Platform as a Service offerings. We will focus on key sales plays where we believe partners can expect the biggest and quickest return. In addition you will be able to meet and engage directly with the Oracle Direct Sales organisation as well as Senior Executives to start working out how you can build pipeline and revenue together.